Mt Spy aka Major’s Hill. 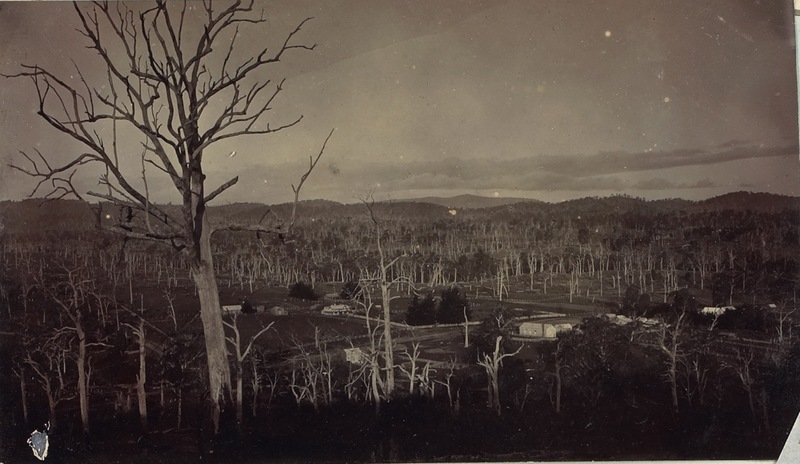 This photo is titled “From Major’s Hill, Strathbogie township in the foreground“. The photo comes from the original ‘Early History of Strathbogie’ (by J.R. Donald and A.W.R Vroland, compiled in 1906, published 1949) and also includes some other fantastic early photography as well. 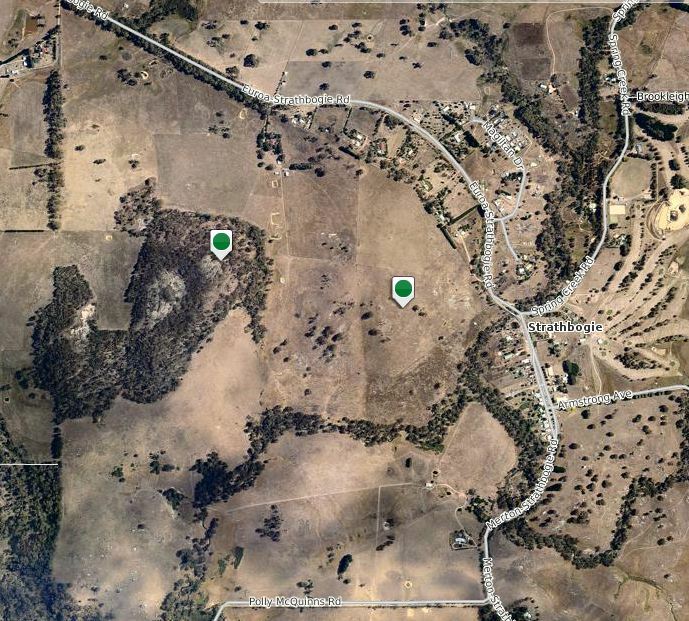 Major’s Hill is the eastern extension of the ridge from Mt Spy that contains one of the Wondoomarook Bushland Reserves – a small patch of rocky crown land surrounded by farmland. Major’s Hill was “.. named after, I presume, one of the early Smith settlers who was known as ‘The Major’.” (L. McPherson pers. comm. 2012). The photo also allows us to recreate the historic landscape and compare it to today’s landscape. Click on the image for a closer look, you’ll be surprised by the detail! Mr Vroland described this ca. 1890 view of Strathbogie as “An Example of Over-ringing”. 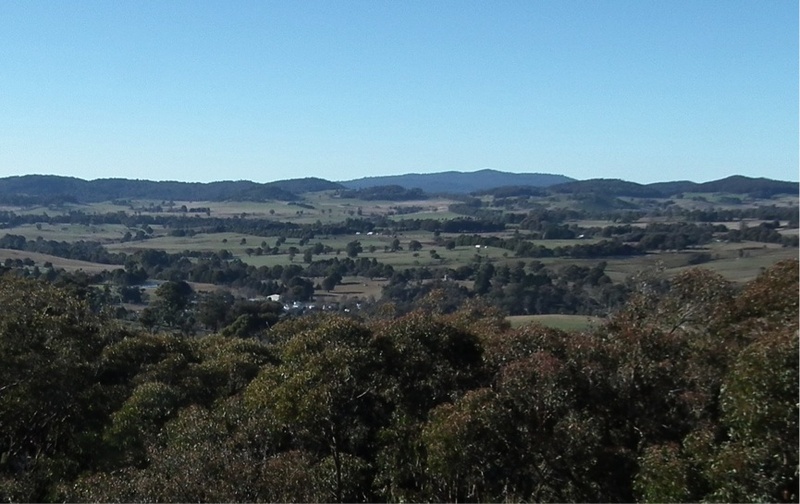 The view is to the SE from Major’s Hill, west of Strathbogie Township (photo by J.R. Donald). Mt Strathbogie is center on the horizon. The curve of the Seven Creeks, with many of its fringing trees spared the axe, is just discernible behind the township area. Notice the large number of dead, ring-barked trees still standing. These stags are all tall (about 35+ m) and straight with major limbs all in the upper canopy. The lack of small branches suggests many of the trees have been dead for at least 5-10 years (pers. obs.). Some fallen timber is visible, so the density of the standing dead trees reflects a minimum density of mature trees in the original forest. Where stags still stand, the land appears to have been quite heavily forested. The shape and clean trunks of the stags also suggests that most were gums (e.g. Manna Gum, Blue Gum). Though the ring-barking has certainly been thorough, there are still living trees, particularly in the middle distance and on the hill-sides. A 2012 view of the same scene, though from a more elevated position and more distant from the township, than the view depicted above. Mt Strathbogie is prominent on the horizon. I’d like to get a photo from closer to the site where the 1906 photo was taken to better compare then and now. The 1906 photo was taken on the lower peak (Major’s Hill), to the west of the summit of Mt Spy, and now completely cleared (below). Left-hand marker shows location of 2012 photo, right-hand marker shows approximate location of 1906 photo. The left place-mark is today’s Mt Spy, the right place-mark shows Major’s Hill. Previous Previous post: I Spy, Mt Spy – Finally!